August 8, 2016 at 12:38 pm. When it comes to budget concerns, the pastor’s mic shouldn’t be up for discussion. Providing a premium spoken word experience comes with a price tag. When capturing speech, a great microphone will sound as if there is no microphone at all — only a transparent, accurate reproduction of the speaker. 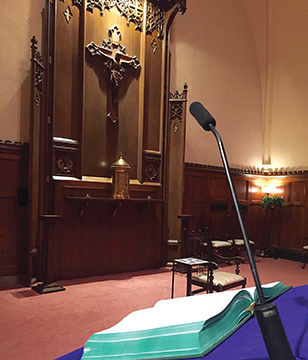 Considering the fact that many church facilities have imperfect acoustics — and some attendees may have hearing issues — it’s imperative that this first step (acquisition) is a premium one. Everything that follows will either degrade or attempt to enhance this signal. Unfortunately, many churches don’t place appropriate emphasis on the pastor’s mic. The first step is understanding how a truly “pastor-friendly” mic looks — and sounds. 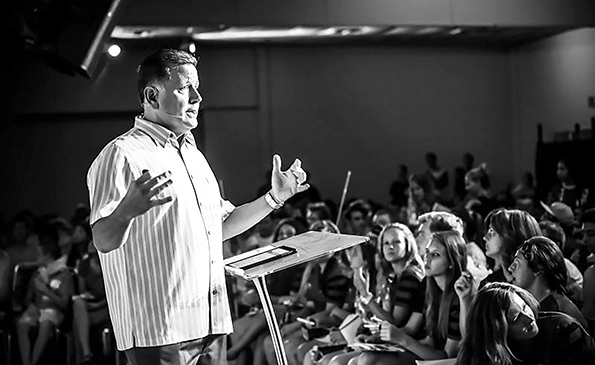 First: what’s your pastor’s preaching style? The Walker. They’re comfortable using their hands, and they walk around to “get in the zone.” For them, a wireless headset mic is a great fit. Whether they’re at the pulpit or roaming, this mic is closer to the sound source: their mouths. The DPA d:fine headset and all DPA mics — also available in directional and omnidirectional models — easily interface with an array of adaptors for all third-party wireless systems. So, you can use your premium mic with all wireless systems worldwide, with extreme intelligibility at the source. The DPA necklace mic also works well for Walkers, because it simply attaches around the neck with the same premium capsule the d:fine headset uses, delivering the same clarity. Finally, a lavalier mic (which clips to the pastor’s lapel) can be a good choice. The Hugger. They prefer to stay at the podium while preaching and use the mic as their center point. Sometimes, they constantly reposition the microphone, which can negatively alter sound and damage the mic over time. For them, I recommend podium mics that are available in many lengths, choosing the correct one will produce consistent sound among multiple users. Uniformity around the mic capsule is also very desirable, as it lets them turn their heads slightly — or look down and up to their PowerPoints — without sounding off-mic. Without this uniformity, intelligibility and sound reinforcement suffer as the sound level goes up and down. A highly directional mic, the DPA SC4098 supercardiod mic is well-accustomed to an even, uniform sound while also reducing off-axis sound. This also results in more speech gain-before-feedback, which everyone can appreciate. The DPA SC4098 podium mic is linear both on- and off-axis, which produces a very natural sound. Why is this important? If there’s an unwanted sound on stage (like a loud A/C unit). No matter where the pastor moves, a premium microphone should not shift frequency as the unwanted sound enters the microphone at different angles. It should sound the same as how our ears perceive sound. An inferior microphone shifts the frequency of the unwanted sound as the pastor moves. Operators usually try to equalize out the unwanted sound — but they’re really changing the desired sound (pastor). This linearity transfers pure, unaltered sound. That’s what you want — especially when multiple mics are added to a production. Here again, our SC4098 podium microphone is a great fit. I’ve seen pastors walk five or six feet away from the pulpit and still be understood. Another option is a wireless directional headset, or lavalier lapel mic, or both. Yes, maybe this preacher needs two mics. When he’s in the moment, your sound team should be equipped to technically follow the production. Microphones come at a variety of price points, but a truly pastor-friendly mic costs a little more: approximately $500 and $800. Here’s why. It performs as advertised. Does the product do what it claims? When you buy a premium product, you’re likely to be happy with its performance on Day One. DPA works quite a bit with film, theatre, broadcast, recording studios and high-end live symphony, Jazz and pop music — and many churches worldwide. We specialize in intelligibility and musicality. With a premium product, you should get positive answers when you ask: What’s the company warranty? Will you back our church if we break a part? If so, how quickly can we get that part? When it arrives, can I get some support on how to install? Natural sound = happy worshipers. With a premium microphone and distribution system, everyone hears natural, pleasant sound. It makes our ears and our brains smile, and our hearts light. Studies show that when sound is properly produced and distributed, we’re happier. When improperly created, you want to leave, and you probably don’t know why — this is called listening fatigue. For worshipers with hearing loss, this is particularly vexing. Think of sound like a rainbow of sound waves. When it reaches you, you’ll see glorious separate colors, if those colors aren’t mixed. If they are mixed — before the sound hits your ear — speech gets muddled. Suddenly, the pastor sounds thin or bass-heavy (not linear) — not like himself / herself. With a truly pastor-friendly mic, pastors should always sound like they do when they’re standing three feet from you: natural. Getting the right mic for the right task requires true stewardship. You really do get what you pay for. Remember: There’s no right way to do the wrong thing. Vincent Gabriel Antonini, CTS, is National Sales Support/Business Development Manager for DPA Microphones in USA.